Home » Blog » The tamales are on us, volunteers. You deserve it! The tamales are on us, volunteers. You deserve it! 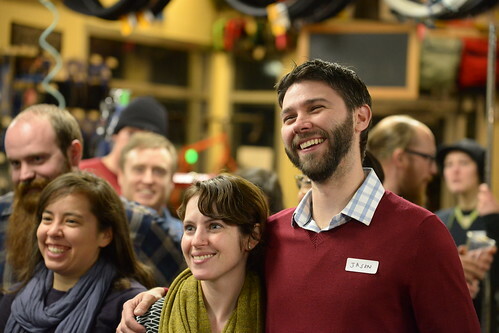 That’s right, last night was our annual appreciation event for the many volunteers who support our work every day of the year, and 2013 was a big one for the Community Cycling Center. After feasting on a beautiful tamale spread from La Bonita, we started the night with our COO, Anne, and Director of Operations, Jonnie, who set the scene for our progress made in 2013. This is important to note: with a year full of staff transitions. unfilled positions, and a loss of staff capacity, our volunteers rose to the challenge to ensure the delivery and success of our programs and community engagement. Community Cycling Center staffers took turns highlighting the impressive and unique contributions made by volunteers in significant areas. A teacher who brought his bike maintenance service learning class into the shop to refurbish bikes to benefit the Holiday Bike Drive. A volunteer who helped us bridge language barriers by providing language-specific instructions on bicycle maintenance to members of Andando en Bicicletas en Cully, the bike committee at Hacienda CDC. A family that volunteers together regularly at Tuesday Drop-In Nights to give back to their community that has given them so much. Our volunteers pulled us through 2013 to provide top-notch delivery of our mission to kids and adults in Portland who need access to bicycles the most, we were joined by an impressive 817 individuals totaling 9,651 hours of support. Volunteer Appreciation Night wouldn’t be complete without the awesome door prizes donated by some ridiculously supportive businesses. A handful of lucky volunteers walked away with bags of Nossa Familia coffee, lights and beanies from PDW, wine from Casa Bruno, and even our own, branded water bottle, bell, and coffee mug. Thank you to all of you amazing individuals who came out in 2013 to help us do more within our community. We have a big lineup for 2014 and I can’t wait to work alongside you once again! All photos by Charles Edelson.